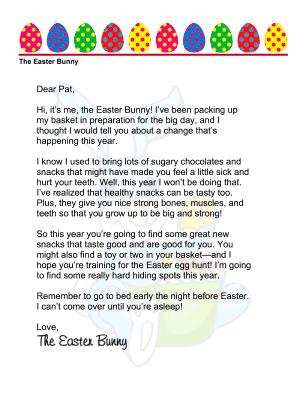 Notify your child in advance that the Easter Bunny will be bringing healthy snacks instead of sugary junk food with this free, printable holiday letter. Hi, it's me, the Easter Bunny! I've been packing up my basket in preparation for the big day, and I thought I would tell you about a change that's happening this year. I know I used to bring lots of sugary chocolates and snacks that might have made you feel a little sick and hurt your teeth. Well, this year I won't be doing that. I've realized that healthy snacks can be tasty too. Plus, they give you nice strong bones, muscles, and teeth so that you grow up to be big and strong! So this year you're going to find some great new snacks that taste good and are good for you. 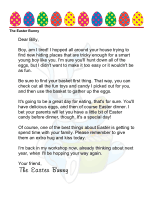 You might also find a toy or two in your basket-and I hope you're training for the Easter egg hunt! I'm going to find some really hard hiding spots this year. 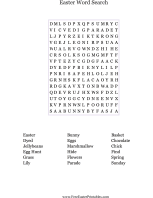 Remember to go to bed early the night before Easter. I can't come over until you're asleep!